SKU: 006PPFX-01. Category: Hand Knitted Dolls-Hand Puppet. Tags: animal, bangkok, birth day, boy, child, cotton, dolls, gift, girl, handmade, kid, organic cotton, organic island, sewing, shop in bangkok, souvenir, thai gift, thailand, toy, toys, กรุงเทพ, กิ้ฟช้อป, ของขวัญ, ของที่ระลึก, ของฝาก, ของเล่น, งานถัก, ตุ๊กตา, ตุ๊กตาผ้า, ตุ๊กตาสัตว์, ผู้ชาย, ผู้หญิง, วันเกิด, วัยรุ่น, ออแกนิค, เด็ก, โทรศัพท์, ไทย. Hand-Knitted Dolls-Hand Puppet 24 CM. ตุ๊กตาไหมพรม งานถักด้วยมือ รุ่น Hand puppet 24 cm. 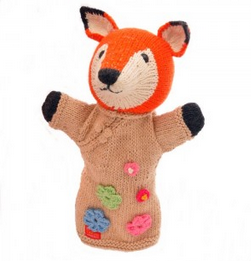 Adorable little animals hand-knitted in organic cotton. These baby animals make beautiful, collectable toys for kids. 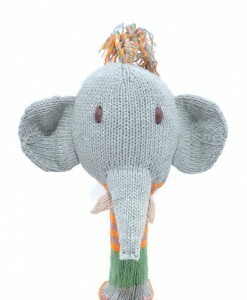 They are designed to match with our other soft toy collections, These toys also have a hanging loop at the top of the head. 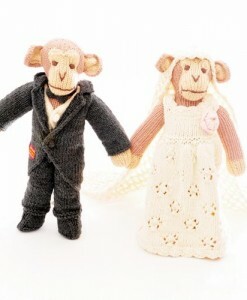 They are available here in the following styles: dog, rabbit, koala, panda, cow, monkey, elephant, mouse. 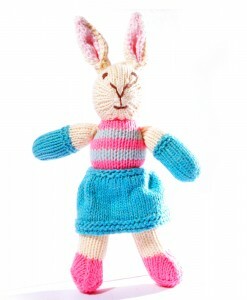 They are hand-knitted in organic cotton, with Oeko-Tex certified polyester stuffing. Each toy measures roughly 24 cm. from toe to top of the head.